← Waiting For A Dip In The Stock Market Is Risky..
A rally in the dollar today has caused gold (NYSE:GLD) to sell off by a few points. Silver this time is following. However we still don’t seem to be near a daily cycle low. Wait for sentiment to get more bearish and the 5 day RSI indicator to get oversold especially if you are considering a leveraged position. When you trade cycles, its all about order entry. Patience is the key attribute. Just leave this down-run play out. It may not have much more to go. Sentiment will drop slowly if gold continues to trade sideways but we do need more downside in order to fuel the next run up.. 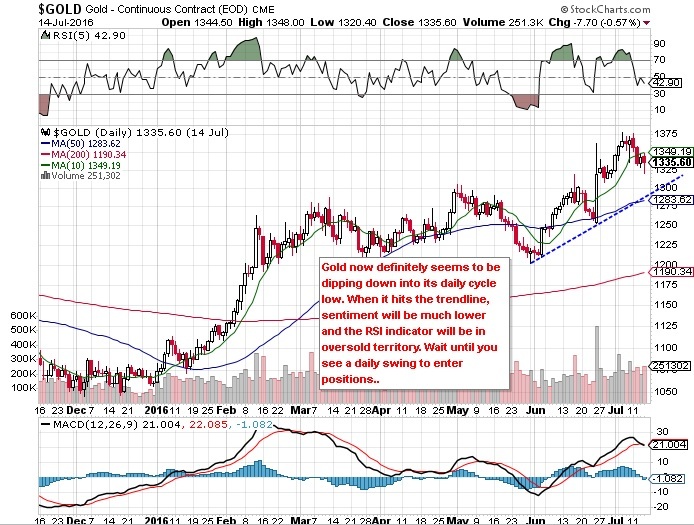 This entry was posted in Trading and tagged (NYSE:GLD). Bookmark the permalink.